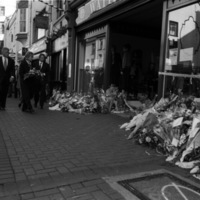 Flowers at bombing site on Market Street in Omagh. 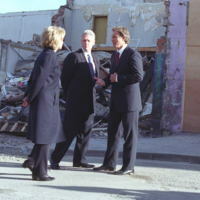 President Clinton and Hillary Rodham Clinton and British Prime Minister Tony Blair visit a bombing site in Omagh. 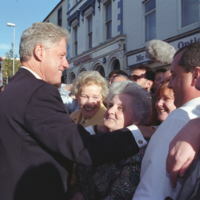 President Clinton and Hillary Rodham Clinton place flowers at the site on Market Street. 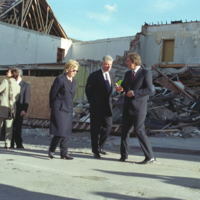 President Clinton and Hillary Rodham Clinton and British Prime Minister Tony Blair visit a bombing site in Omagh. 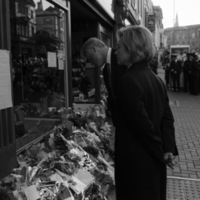 They unveil a plaque and place flowers at the site on Market Street. 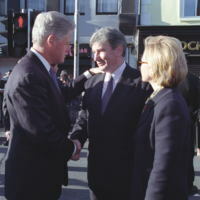 The President and First Lady shake hands with the mayor of Omagh. 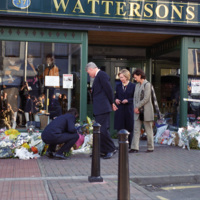 The President and First Lady walk by the bomb site with British PM Tony Blair. 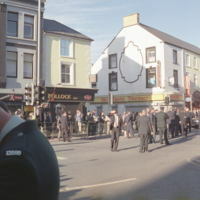 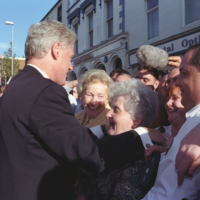 President Clinton comforting the citizens of Omagh. 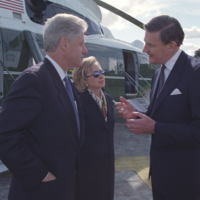 The President and First Lady listening to Lord Lieutenant Duke of Abrecorn in front of Marine One.